I bought a stick of natural deodorant a while back and loved how great it smelled and the fact that it contained no aluminum. My husband is allergic to aluminum in deodorants so we tried it out on him to see if this kind irritated his skin. To our complete happiness, it didn’t. The only problem was, this natural deodorant was very expensive when compared to the price of regular deodorant; about twice as much, actually. I just couldn’t see myself paying this amount for the long run and when I looked at the ingredients on the back, it kind of surprised me as they were all things most people (well me, anyways) have in their homes or can easily obtain. I decided to play around a little bit with the ingredients and make my own. The first batch was too soft and it crumbled as I tried to apply it. This batch was perfect as I adjusted the ratios of ingredients. 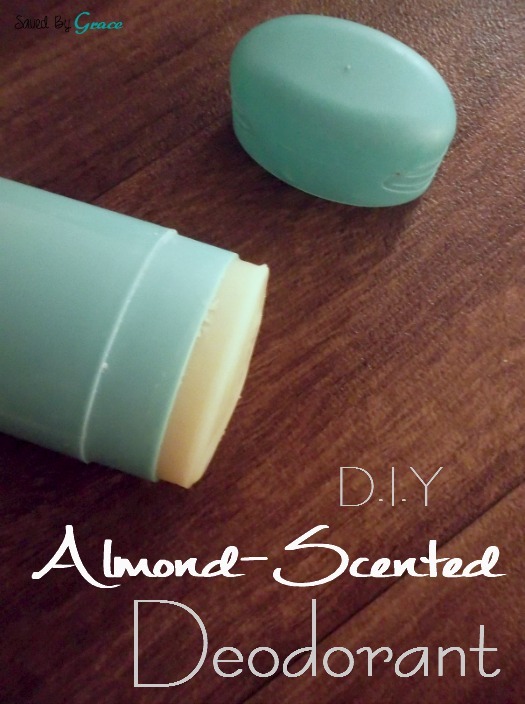 So here it is, my homemade almond scented deodorant recipe! Make sure you read the notes on this recipe as it is a bit different than the store-bought stuff you are used to. First, add a glass jar or measuring cup to a pot and add water to the pot, creating a double boiler. Add your beeswax to it and start it simmering. When the beeswax is melted, add in your coconut oil and raw Shea butter. Melt until all parts are liquid. This happens pretty quickly. Add in your essential oil and mix well. Remove from heat and add in the arrowroot flour and baking soda. 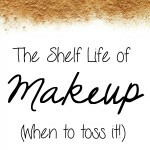 Mix it into a runny paste and quickly pour into an empty, clean deodorant container. Allow to harden overnight without the lid. This deodorant will not work as an antiperspirant. It will only mask odor but may keep some wetness down as it contains baking soda. Natural deodorants take some time to get used to. Do not apply heavily and do not press too hard when you apply. Your body may go through a detoxing period and you may think it is not working. It takes a while to balance out your PH levels after stopping store-bought deodorant. Give it some time. If irritation persists, try using half as much baking soda and upping the arrowroot. You can purchase empty deodorant containers online for fairly low cost or you can just save an old one and wash it out like I did. Beeswax, arrowroot and Shea butter can be bought there as well. This post contains affiliate links. Purchasing from them helps me keep my blog going, so thank you very much! You are a real pioneer, huh? I love this idea. I think I will bookmark this post and do this as a rainy (or snowy) day project this winter! Kind of neat to make your own deodorant.. have to give it a try.. This is so cool! I’ve seen a lot of DIY personal care items, but this is the first time I’ve ever seen deodorant. This is great! I’ve made my own sunscreen, but not deodorant. And, that it smells like almond, it must be great! That is pretty cool that you make your own deodorant. I love that it is almond scented. Michelle F. recently posted..Hoodsbee – The Cutest Hoodie Ever! wow! Amazing! You are the first person I’ve met to make their own deodorant. That’s great that your husband doesn’t have to worry about his aluminum allergy anymore. Heather recently posted..Saturday’s Notebook, Will You Join Us? Wow I didn’t realize making your own deodorant was so easy. I might have to actually do this. I make my own coconut deodorant but haven’t thought to use almond oil—I will have to try that! That’s so ambitious to figure out how to do it yourself. I’m really glad it’s working out so well for you! 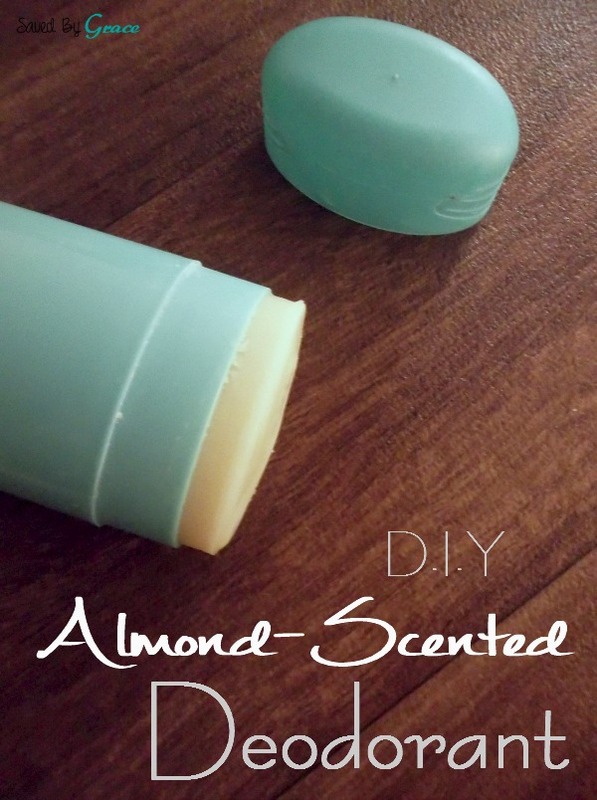 Almond scented deodorant sounds fabulous! That’s cool that you made it! Oh wow. I never even thought about making my own deodorant. That is pretty cool. Mistee Dawn recently posted..Things to consider when choosing new bathroom faucets. that looks easy enough to make, i never have before. very cool. I am totally tempted to try this! 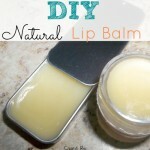 I love DIY beauty products! Wow! What an awesome DIY. I love it! 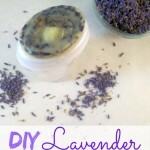 Making your own deodorant seems really cool! I just tried to make this deodorant recipe and I am just wondering, every time I make a homemade lotion or deodorant or hand salve it ALWAYS just smells like beeswax .. or coconut oil. I follow the recipes exactly, but no matter how many drops of essential oil I use, the beeswax or coconut oil overcomes the scent. For this recipe, I use patchouli essential oil as I didn’t have almond essential oil and all I can smell is the beeswax…I would love love love to be able to make homemade products but find it frustrating that all of my products only smell of beeswax or coconut oil. Is there some trick that I am missing?….please advise!! Emily, I honestly don’t know what you could be doing differently. I enjoy the smell of the beeswax and the coconut oil so I am not bothered if the essential oil is super mild smelling over them. Some essential oils are also not pure and this will lead to a smell that is not as vibrant. I would just experiment with different brands and try to find one that you like. If you want a very strong smell, maybe try adding it at a different time during the mixing process of whatever it is that you are making. Sorry I am not much help! I certainly do not mind the smell of beeswax either, I would just prefer my essential oil scent to be the main smell is all, because I just love the smell of patchouli. Thanks for your advice; I will do some experimenting. Awesome Emily! I am so glad you like it. I played with several other recipe to get the right consistency and I am really glad it’s working for you! Hi! What brand of almond essential oil do you use? I can’t find it anywhere. 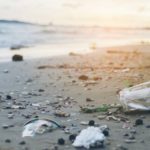 You want to stay away from fragrance oils if you are looking for the benefits of essential oils as they are man made and synthetic (the fragrance or ‘perfume” oils). If you don’t care either way, they can be cheaper to use and will make the deodorant smell good, although they can upset some sensitive skin issues.